from 2010 to 2014 AD. if you discover any errors or with any Significant event which you think should be included. Lionel Jeffries Dies in Poole. BRITISH actor, screenwriter and film director Lionel (Charles) Jeffries, who had life-long links with Dorset, died at the age of 83. He was born in Forest Hill, London, on June 10, 1926, but lived most of his life in Verwood and Bournemouth (Westbourne). While in Verwood he lived in a house near the Crossroads and attended Wimborne Grammar School. In later life he deeply regretted the loss of the old school buildings in Wimborne and branded their replacement “like something out of Belsen.” He was awarded the Burma Star for his World War II service, before training at RADA. For a time he was also president of the "Verwood Dramatic Society". He made his screen debut in 1950 appearing in over 70 films, as well as television in his later years (including Inspector Morse) and famously directed “The Railway Children” in 1970. William Allison, his great grandfather had a barbers’ shop in Bournemouth Square which displayed the royal standard as he had cut the hair of King Edward VII, the Prince of Wales, during a stay at the Royal Bath Hotel. His grandmother was born in Bournemouth and his mother lived in Charminster. He married Eileen Mary Walsh in 1951 and had a son and two daughters. He died in Poole after a long illness. 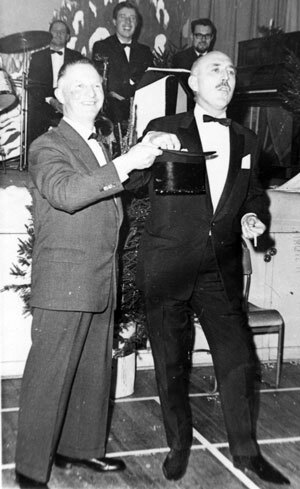 The picture shows Lionel Jeffries with Aubrey Barrow in Verwood Memorial Hall. 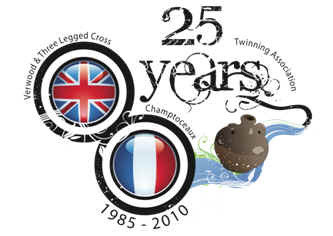 13th May In 2010 Verwood Celebrated 25 years of twinning with Champtoceaux in France. Over 70 friends from Champtoceaux arrived and stayed until Sunday morning the 16th of May. They were welcomed with a cream tea at the HUB by the Mayor of Verwood. 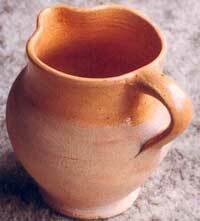 While in Verwood they were taken on a coach outing to Lacock Village, the Fox Talbot Museum and Stonehenge. On the saturday evening a soiree was held in the HUB. 17th July Club 31 launched - The Old British Legion club complete with all its fixtures and fittings,was bought by a Cambridge developer and ownership transferred. It will be run as a separate company limited by guarantee so all profits will be ploughed back into the club. 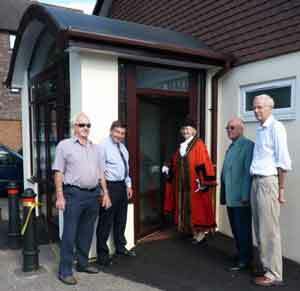 was inaugurated by Verwood's mayor Cllr Jean Hazel..
Photo l to r: Peter Hancy, Eric Burton (chairman), Cllr Jean Hazel (Mayor), Ernest Whatmore & Barrie Collins. Verwoods Mayor Cllr Jean Hazel and the Town Council welcomed dignitaries from the local areas with a visit to the VHHC where they enjoyed an illustrated talk by Pam Reeks. Later they were entertained by Verwood Concert Brass and "Jubilate" before enjoying a reception and meal in the Verwood HUB. 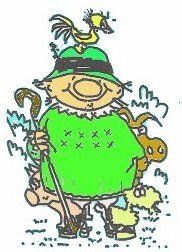 The Society has been running for 27 years and performed most of the many traditional pantomimes, many of them 2 or 3 times. With the improved facilities at the HUB used since 2008 (Previously the Memorial Hall) made the Peter Pan production possible. 2011 - Jan. The New Co-operative food store built at the junction of Ringwood Road and Blackhill opened for business. 2011 - April JC's Video store in Ringwood Road which had been closed, opened as an Italian restaurant. It was originally Barrow's Grocers which then became a SPAR Grocery Shop. 2011 - 6th June Verwood and Three Legged Cross Twinning Association returned from France on the 6th of June 2011 after their visit to Champtoceaux. Please select here for a full report. 2011 - June The SPAR Grocery shop situated next to the Verwood Heathland Heritage Centre closed. It was re-opened for business as a Costa Coffee shop. VERWOOD Leisure Centre in Chiltern Drive sold to make way for a Morrisons supermarket extension and a petrol station. At the time of writing it is intended to move the Leisure Centre’s fitness equipment to the Hub community centre, in Brock Way, Money will also go towards a public sports hall at Emmanuel Middle School and the Verwood HUB will be extended. Verwood's Mayor Cllr Toni Coombs and the Town Council welcomed dignitaries from the local area with a visit to the VHHC where they enjoyed a talk by Sue Gardiner on the "Origins of Pantomime". Dorset Junior Jazz Band entertained before enjoying a reception and meal in the HUB. 27th Dec Verwood's new Club 31 which took over the British Legion premises, ceased trading. At the time of writing the buildings future is not known. 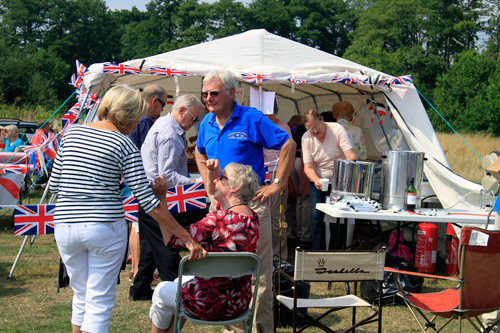 August Verwood and Three Legged Cross Twinning Association welcomed our friends from Liederbach (near Frankfurt) during the Rustic Fayre weekend at the end of August 2012. 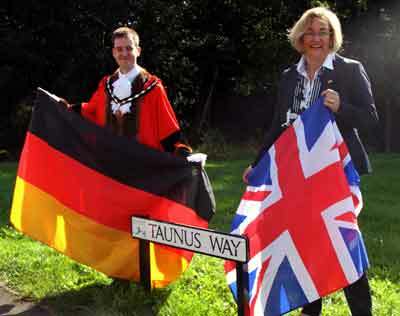 The picture shows Cllr Simon Gibson, Mayor of Verwood and Frau Eva Söllner, Burgermeisterin of Liederbach, unveil the new road named “Taunus Way”. 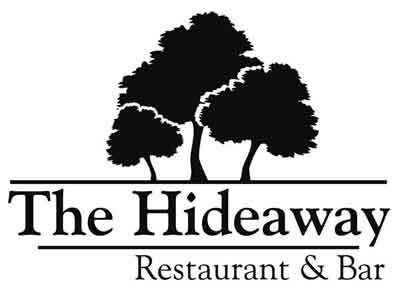 has now re-opened as The Hideaway - Restaurant and Bar. The "Verwood Traditional Jazz Club" has returned, as it used to use the original British Legion premises. Verwoods Mayor Cllr Simon Gibson and the Town Council welcomed dignitaries from the local area with a visit to the VHHC where they had a talk given by Pam Reeks on "Verwood Concert Brass". Later they were entertained by a group of musicians from the Concert Brass" before enjoying a reception & meal in the HUB. 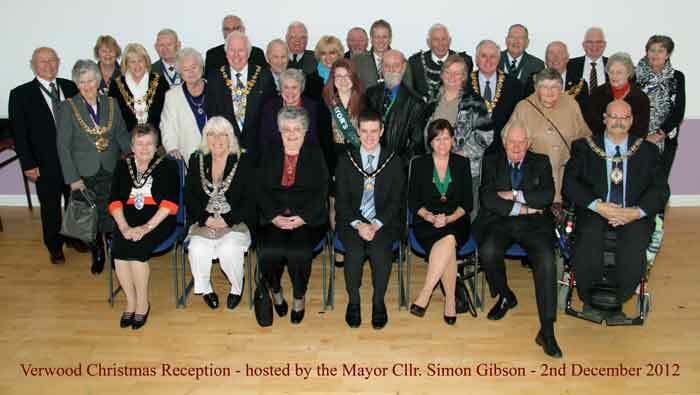 2nd Dec. At the Mayor's Christmas reception on the 2nd of December three local people were honoured with the title "Freeman of Verwood". Angela Daymond, Colin Bateman and Pam Reeks are shown with the Mayor Cllr Simon Gibson. 3rd Dec. The cafe "Plane Cuisine" opened on the corner of Vicarage Road, in premises which had previously been a Grocers (Eversons), an Estate Agents (Brian Hall) and a Betting Shop. 2013 - January The new 3G Astroturf Arena was opened at Potterne as part of the planned Leisure Centre demolition to make way for a new Morrisons Supermarket. - Lifestyles manage the 3 facilities at Emmanual School, Potterne and the HUB. Jack and the Beanstalk by Alan P Frayn. The Society has been running for 28 years and performed many traditional pantomimes, and has used the HUB since 2008. 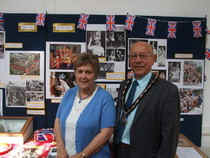 2013 - June The Heathlands Heritage Centre held an Exhibition to mark the 60th anniversary of the Queen's Coronation. 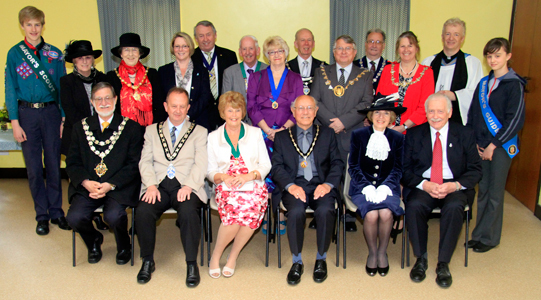 Verwood Town Mayor, Cllr. Peter Richardson, visited the Centre and was shown around the exhibition by Mrs Vivien Clifton who with Pam Reeks had mounted the display. June 2013 The new purpose-buit extension to the Hub, opened in June 2013, is home to the Lifestyle Active 50 station gym. This replaces the Leisure Centre which used to be by Morrisons Car Park in order to facilitate the building of a new Morrisons supermarket which opened in Sept 2014. 26th August VERWOOD RUSTIC FAYRE 2013 was held at Potterne Park Verwood on August Bank Holiday Monday from noon - 05:30 p.m. in support of local & Rotary charities. Classic Vehicles, Stalls, Refreshments, Craft and a Car Boot Sale with Arena events. 2013 - September A new 4 court Sports Hall at Emmanuel School in Howe Lane, was opened as a shared facility with the school as part of the planned Leisure Centre demolition to make way for a new Morrisons Supermarket. - Lifestyles manage the 3 facilities at Emmanual School, Potterne and the HUB. 10th Nov Sunday the 10th of November was the last time that the 126 Petroleum Squadron from West Moors would take part in the church service and parade on remembrance day in Verwood. The soldiers in 126 Petroleum Squadron were from all over the UK and trained future petroleum operatives. The training facility remains but the 126 Squadron will no longer be involved. November Since founding The Jenny Porter Singers 22 years ago, their conductor Jenny Porter retired to go travelling with her husband. The "Singers" give 2 concerts a year and give donations to local charities as well as performing short concerts for local associations. The last concert under her baton was the 'Christmas Reflections' concert at the end of November 2013. Their new conductor, Peter Coole who took over in January under a new name. 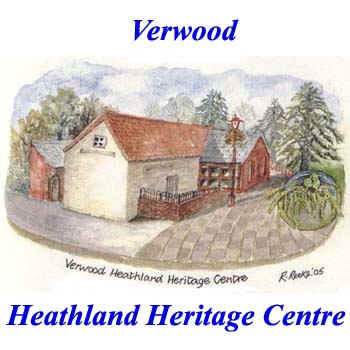 The Mayor of Verwood Cllr Peter Richardson and the Town Council welcomed dignitaries from the local area with a visit to the Heritage Centre. Later they were entertained by a group of musicians from the "Verwood Concert Brass" before enjoying a reception and meal in the Verwood HUB. January Verwood’s Mrs. Pam Reeks has been awarded the British Empire Medal for services to the community in the 2014 Honours List. January The building of the new Morrisons store begins. The pharmacy has been moved into a temporary building at the front of the store and the old Leisure Centre and shops are in the process of being demolished. 25th April On Friday the 25th April 2014 Pam Reeks was presented with her British Empire Medal, by the Lord Lieutenant in Dorchester which was awarded for services to the community in the 2014 Honours List. 27th April Verwood's Mayor Cllr. 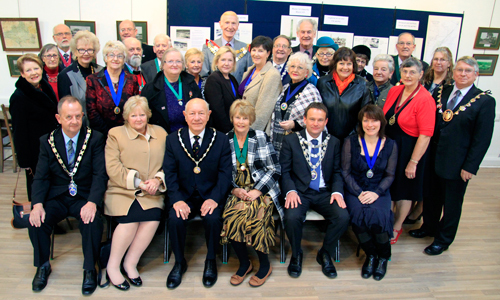 Peter Richardson hosted a "Civic Service" for other local mayors, Dorset Dignatories and residents. It was held at "St Michael and All Angels" church followed by refreshments. Seated from L to R :- The Mayor of Bournemouth - Dr Rodney Cooper, EDDC Chairman - Cllr Malcolm Birr, Mrs Richardson, Cllr Peter Richardson - Mayor, High Sherriff of Dorset - Catriona J Payne and consort of the High Sheriff. 4th August Verwood Town Commemorated the start of WW1 at the and re-dedicated the "Verwood Memorial Recreation Ground". 25th August VERWOOD RUSTIC FAYRE 2014 was held at Potterne Park Verwood on August Bank Holiday Monday from noon - 05:30 p.m. Unfortunately the weather was extremely unkind and it rained for most of the day so numbers and takings were down. In August 2014 the Verwood Twinning Association visited Its twinned town of Champtoceaux, and its Canton accompanied by the Verwood Concert Brass. 6th Oct. The New Morrisons Store opens its doors for the first time and the old store is cleared ready for demolition. 9th Nov. Royal British Legion Remembrance day - 2014. 28th Nov. The New Morrisons Store opens its extension to the Car Park on the site of the old supermarket which has now been completely demolished. 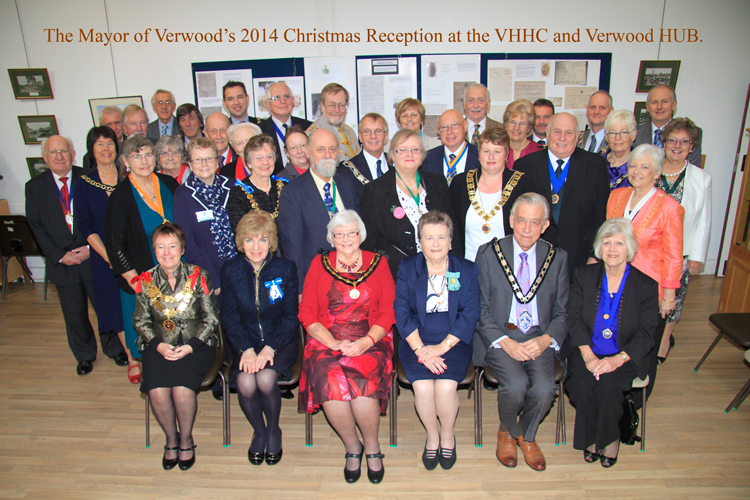 On Sunday the 30th November 2014, the Mayor of Verwood Cllr. Pat Morrow and the Town Council welcomed civic dignitaries from the local area including the High Sherriff of Dorset - Jane Stichbury CBE QPM DL and the Chairman of East Dorset County Council at the Heritage Centre. Later at the Verwood Hub they were entertained by the training band of "Verwood Concert Brass" and the "Verwood Choral Society". Before enjoying their meal however, all the mayors entertained the audience by singing the "12 days of Christmas", complete with actions.